The film is divisive and flawed in places (it could've used an extra 30 minutes to flesh out a few ideas better) but it's a fantastic deconstruction of the tropes that have haunted the entire franchise (and most generic sci-fi) with some of the best cinematography in the franchises history. I rather enjoyed it in comparison to the cookie cutter TFA. Yes, didn't like the film but a decent price. This film is awful, but this is a good price for those that wish to suffer watching it. Quite possibly, but having not yet seen the film buying a hard copy on DVD for the same price as a 48 hour digital rental seems like a decent price. Good price, questionable film. I liked it the first time I saw it, but the more I think about it, the more problems I have with it. 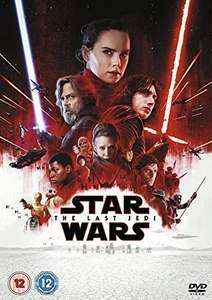 Worth watching once if you're interested in the new Star Wars films just so you know what's going on when the next one comes out, especially for a fiver. It was significantly worse than Force Awakens imo though, full of nonsense plot points and wasted opportunities. Wish I hadn't clicked now. Whenever I allow myself to contemplate this film it depresses me. This film completely breaks the rules of the Star Wars Universe. Amazed it got released to be honest as it has so many flaws. But yeah, seems like a good price for a throwaway film for the kids - so reticent heat from me. gidsterc:This film is ‌ (poo)Quite possibly, but having not yet …gidsterc:This film is ‌ (poo)Quite possibly, but having not yet seen the film buying a hard copy on DVD for the same price as a 48 hour digital rental seems like a decent price. I thought it was possibly the best Star Wars since the originals, personally. Lots of really vocal hate on it as it seemed to be the popular opinion to have, but lots of people liked it, too. And not just "It was dumb but entertaining", or "I'll fawn over anything Star Wars", I thought it was legitimately good. It's not what many were used to though, and lots of people didn't like the 'diversity' in the movie, so dont get too influenced by what others felt. Internet has a tendency to propagate hivemind mentalities. Saw once in the cinema and that's enough I think. Hopefully 9 can fix this mess.